Why am I the only one who has bad thing after bad thing happen to them? How many times have these kinds of thoughts gone through your head? I’m betting at least once or twice. As humans, we seem to have an uncanny knack for writing things off as good or bad luck. With many aspects of personal finance, rationality sometimes goes out the window. It’s much easier to point to an external force than it is to give credit where credit is due, or to take ownership of our mistakes. While it can seem harmless in small doses, over time, this negative phrase builds up in our minds and can be extremely detrimental to our financial progress. I’m here to tell you that it’s NOT luck, it’s hard work. There’s really no such thing as “luck,” and attributing success or bad events to it doesn’t do anyone any good. Yes, things may happen that are out of your control, but chalking it up to “luck” is silly. It’s extremely easy to point to someone who has retired early and think they’re living the life; that it was handed to them on a silver platter. In most cases, that’s not true. Not even close. You do yourself a disservice when you don’t look into the reasons why someone has been successful. 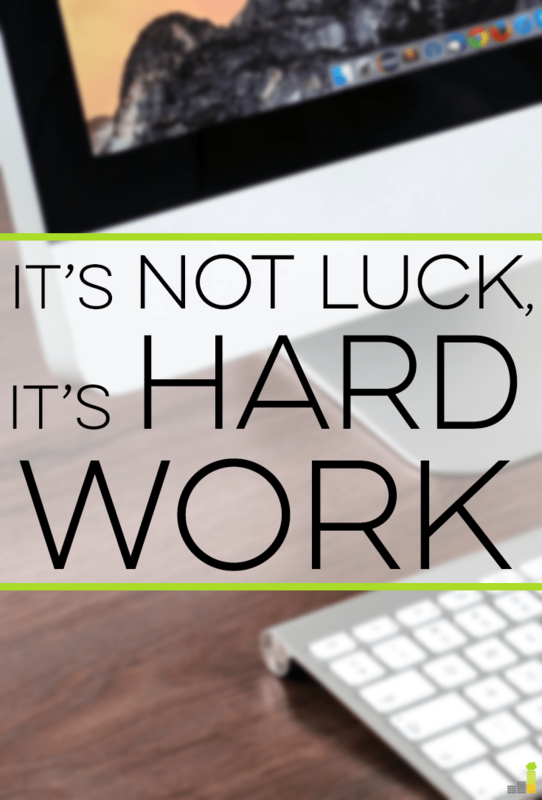 Behind most success stories lies hard work – not luck. The overwhelming majority of people don’t ‘luck’ their way into wealth, or into a job, or into debt freedom or into anything else you might be jealous of. They became wealthy through hard work and being diligent about their finances; they secured a job because they had a connection (they likely worked for) or experience (years of work); they worked hard to pay off their debt, or worked a lot to earn more to pay it off. Whatever the case may be, stop believing that luck has all the answers. It doesn’t. By basing assumptions on luck, you’re essentially telling yourself that you can’t achieve what others have because it’s happenstance. That’s not true! I’ll use myself as an example here. I am terribly guilty of looking at the income reports of people who have started their own blogs or online businesses with as little as a laptop, cheap hosting through Bluehost and their smarts and thinking they’re pretty darn lucky to be making $10,000 or $20,000 per month from their business. Before I was self-employed, that income level seemed completely unattainable to me because I was stuck in a low-paying office job. I was barely making $2,000 per month. Once I started freelancing, I realized my earning potential was in my control. I realized these people weren’t lucky – their income was a direct result of their hard work. I finally realized I could get there if I wanted to. Now, my income level still isn’t as impressive when compared to those numbers above, but the point is, I stopped attributing it to luck, which allowed me to take control of my situation. It inspired me to reach for greater heights. When I wrote wealth off as “luck,” I dismissed it as a possibility for me because, well, I thought I’d never be “lucky” enough to have a high-paying job. Then I went and increased my income by creating my own job of sorts. Talk about powerful! I hope you can see how limiting it is to believe in luck over hard work with this illustration. Do You Write Your Own Good Fortune Off as Luck? Another thing I struggle with (and I’m sure I’m not alone) is thinking that whenever something good happens to me, it’s simply a result of good fortune. It’s not a result of anything I did; it’s just a nice change of pace. How awful is it to not give yourself any sort of credit? “Oh wow, you got a promotion at work, awesome!” “Yeah, no one else seemed interested in it, and I’m kind of qualified, so I guess I got lucky.” How about saying, “Thanks, I worked hard for it” instead? Many of my fellow freelancers are quick to dismiss what they’ve achieved, myself included. This is what I was supposed to do – this is where I’m supposed to be – what’s the big deal? Big deal!? Working for yourself is hard. Building your own business from scratch is difficult. Yet, we never give ourselves any credit. I’ve been guilty of saying I lucked into most of my clients through word-of-mouth, never mind that they’ve only stuck with me because I’ve proven my worth. Please don’t use luck in this sense of the word, either. It completely diminishes the work you have put in. The point is, all of the successful people I know created their own success. They didn’t rely on ‘luck’ to make it happen. You can’t make anything happen if you sit around and hope for it. You have to take action. The best thing you can do is delete the word luck from your vocabulary. Be mindful of when you’re tempted to use it and catch yourself before doing so. When someone tells you something good happened to them, appreciate what got them there in the first place. And when something good happens to you, take a moment to appreciate the journey you took to get there. You can experience amazing financial success if you’re willing to put in the work, but you won’t experience success if all you do is equate success to luck. Remove luck from the equation so you can empower yourself to take control. Have you ever written off a success or failure as good or bad luck? Do you believe in luck? When is the last time you called someone “lucky” for their success? Do you have trouble attributing your own success to hard work? 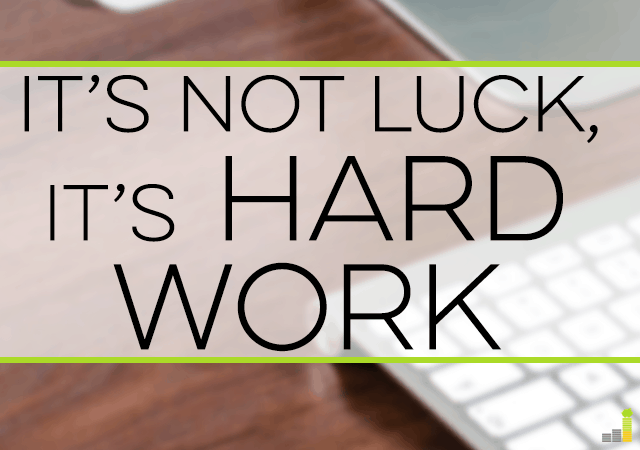 I agree that you won’t be successful without hard work, But I disagree that luck plays no part.Success is without a doubt the result of hard work…and usually an absence of bad luck. There are a lot of people who work really hard and get no where. There are a lot of people who can’t work as hard as they are willing due to ill health. There are a lot of people who get trapped into circumstances beyond their control, at least for a while. So by all means, make your success. You won’t be successful without hard work. But don’t forget that you are lucky too. I agree that there are some people who don’t have the same opportunities and advantages as some people…but again, it’s all about creating those. Otherwise we wouldn’t have “rags to riches” stories. There can also be cases of “being in the right place at the right time,” but my point is that *overall*, success comes from hard work. It’s not purely luck. Most people don’t have amazing jobs fall into their lap, or a wad of cash just show up at their door. As for some people working hard and never getting anywhere, I haven’t seen that be overwhelmingly true in my network. However, I do have friends that DON’T work hard, and complain that they haven’t gotten anywhere. If you’re willing to work hard and aren’t seeing the results you want, then it’s worth looking into the strategies you’re using as far as job mobility goes. I do agree with you that some people aren’t able to do what they want due to illness. Sometimes we have to re-define what “success” means in that case. I still don’t agree on calling myself lucky. Here’s my perspective – when someone tells me “You’re so lucky!” it seems dismissive. I got to where I am today because I started a blog, poured hours of my time into it, building a community, writing, and networking. I am extremely grateful to be in the position I am, and I don’t take it for granted. People don’t seem to understand the level of work that goes into being self-employed, though. I find they say “lucky” because they think I’m watching TV and browsing YouTube all day and doing next to no work when that couldn’t be further from the truth. When people tell me that, I immediately say they could do it, too – if they wanted to – but many are prone to making excuses that hold them back. Oh how this post resonates with me. I’ve heard that line so many times before that it is really quite tiresome. People who resent others’ success need to spend a day or week in the shoes of the successful one before spouting off about luck. When I worked for a doctor, other employees resented his income. But his day was brutal. He was up for hospital rounds before he came to the clinic which started at 8AM. He never took lunch. He met with pharmaceutical reps in between patient appointments. Then after clinic finished, he met with patients attending weight loss classes taught by staff dieticians until 6PM. After that, he did paperwork and dictation for charts. When he finally left the office, he might do another round of hospital calls if there were new admissions, and always carried home medical journals to read at night. In addition to all of that, our clinic participated in drug trials for drugs in development and he had to monitor those participants. I’d like to see the average person put in that kind of day every day of the week. Oh gosh, I got tired just from reading that! Most doctors definitely lead busy lives. It’s extremely easy to get jealous of the numbers people pull in, but we need to take a step back and realize exactly what’s required to get there. I used to thing well established bloggers were ‘lucky’ because they started when the industry was at its nascent age, but when I decided to start blogging, I realized that there’s a lot more than simple luck involved. It’s hard work, even though you can do it without leaving your home. You have to be consistent, motivated, innovative and really be eager to learn and try out new marketing techniques. It’s all hard work. But I think the problem lies in our perception of the word ‘luck’. The Roman philisopher, Seneca, said, ‘Luck is when preparation meets opportunity,’ and I fully agree with that. I was in the same boat, Fehmeen. While it’s true it’s harder to break into blogging now because there are more blogs, it’s not impossible. As you said, it’s a matter of putting in the work and trying out new techniques. If you’re passionate about what you’re saying, chances are, there’s an audience that needs to hear it. True – it does depend on your definition of luck. I would agree with that as well. You need to be open to (and looking for) opportunities. If you’re not, they’ll pass you right by. I think occasionally I believe in luck, but usually there was something that put that individual in the right place to receive luck, if you know what I mean. I think “unlucky’ people or people who say they are, tend to have a very small appreciation of life, meaning they always seem to point out the bad instead of the good. For instance some unlucky individual might be complaining about someone else making 20k from their blog and they aren’t, so they consider themselves unlucky. In the meantime, they might be in awesome health, where that 20k person might have a chronic health condition, but they just choose not to spotlight it. Luck is equally about perception of one’s life. Financial success is nearly always a direct result of hard work and smart choices. However, hard work and smart choices don’t always lead to financial success. It’s difficult to walk the line between having appropriate levels of compassion and recognizing that life is simply not fair. Even if you wanted to look at it on a case by case basis, you would rarely come away with some clear cut conclusion as to whether somebody needs to work harder and change their attitude, or if they simply need to get lucky. It’s true there are a lot of variables involved. My point with this post was to motivate people to take action because I see far too many make excuses or think they’ll never “get to that level.” It’s at least worth trying, rather than thinking someone got lucky. Like Tonya said, it’s a matter of perspective on the situation. You can look at someone who is where you want to be and either get sad that you’re not there, or get motivated to work your way there. I would argue you don’t even need to get to the exact same place because everyone’s journey looks different, and maybe you’re meant to end up elsewhere, but you have to take action to get on the path. Absolutely! All too often I hear others dismiss others’ success as luck. Other than an inheritance or the lottery, it’s usually hard work that leads to success. People might make it look easy, but it’s usually good planning and successful execution that lead to positive results. That’s true in health, money, academics, or any other field (except pop culture perhaps 😉 ). I think “people might make it look easy” is the key. We often don’t see all the hard work going on behind the scenes to make something happen, we just see the end result, which is easier to judge. Ha, well, I’m sure some stars have to work hard, but I’m more than happy to avoid everything else that they have to deal with. Everybody has opportunities they can take advantage of, and they should. Whether it’s rich parents, connections or just simply being in the right place at the right time, there is no shame in taking full advantage of every opportunity in front of you. But without hard work, you’re not going to get very far beyond that. There is really no secret to success besides focused and consistent work day after day. My favorite quote regarding this is by Bruce Lee. He said, “I don’t fear the man who has practiced a thousand kicks one time, but I fear the man who has practiced one kick a thousand times.” Becoming successful requires consistent and focused work in whatever field you choose. Luck plays a factor, but doesn’t ultimately determine success. Great post. Thanks, Syed, you summed it up well! A great (recent) example is winning the lotto. That could be luck…but if you spend all the money, you end up back at square one. You have to know how to maximize the opportunities you’re given. I’m sure there are a few select people who make it far in life without doing much, but that (to me) isn’t a fulfilling life. That’s a great quote, too! I don’t really think of things in terms of luck. I think that good and bad things happen to everyone and that’s just the nature of the universe. I do believe that hard work presents more opportunities to people that others might think of as luck. I know that every success I have ever had in life has come as the result of a crazy amount of time and energy on my part to make it happen. I feel fortunate that I’m not afraid of hard work and actually embrace it because I know it yields awesome results. Sounds like we’re on the same page, Shannon! Very true that good and bad things happen to everyone – that’s just life. It seems like it keeps coming back to perception. You choose how to react to the good and bad. Some people are better at turning lemons into lemonade. Well… some of it is luck. Like being healthy enough to work, for example. Something I wasn’t for a long time, so I think my envy was somewhat understandable when I was reading about people with big incomes. Even now, I’m a little jealous of couples with two incomes because my husband is disabled. But yes, even luck doesn’t go far without hard work. I was incredibly lucky to find a job that I could do from home. I mean, it was literally luck because my mom happened to interview someone and happened to mention that I was disabled. And he happened to be looking for someone in my situation. I’m also very lucky that my boss is incredibly generous with pay and bonuses. There’s no way I should be earning what I do for customer service. But as a couple of people have pointed out, that’s only partially luck. Yes, a lot of bosses are happy to keep paying someone the same (or close to) no matter how much money the employee makes them. I’m lucky that my boss isn’t like that. On the other hand, I *do* make him a lot of money because I’m good at my job, go out of my way to keep customers happy and am willing to take on overtime to help out. So it’s a mix. I like Hannah’s perspective on the matter. It’s hard to shut jealousy away; I think that it’s understandable to feel that way regardless of your situation. Without getting into too much detail, I’m not in the most amazing health, but I don’t have it that bad compared to other people. There are good days and bad days, and I do envy those that can hop out of bed and immediately hammer away at work. But I remain grateful I can work from home and still make a living. It comes down to making the most out of what you have, which you’ve clearly done. It’s hard to address disability when there are so many types. Half the battle for me was getting over the negative narrative I had in my head. Some people impose limiting beliefs on themselves, but when you’re talking about health, there are some *actual* limits involved. I didn’t mean for my post to ignore all of that, and I realize now I made a mistake in generalizing, but when you’re writing to a broad audience, it’s a little difficult to address everything. I only wanted people to come away from thinking they could achieve something that in the past, they thought might have been impossible (within reason), such as my case with thinking I’d never earn more than $20/hr. My favourite definition of luck is: preparation meeting opportunity. All the ‘luck’ in the world won’t help if you’re not ready to take advantage of it. Just look at all those lotto winners who go broke! Someone else had mentioned that, Diane, so you’re in good company! Definitely Erin. I believe we have to control our life from getting out of debt to controlling our wallet. It’s really not about luck, it’s hard work. I do believe in luck but we have to take advantage of it by putting more hard work. That’s the time we increase our savings and meet our financial goals. It’s better when the luck and hard work are combined. Focusing on what you can control is always the best thing to do! I’m glad you mentioned that. I certainly think luck comes into play, but most things are not driven by luck. If you work hard you put yourself in a position to be exposed to opportunities. I consistently have used my book as an example. While luck may have come into play (with the publisher reaching out to me and not someone else), luck didn’t start my blog or spend thousands of hours (I don’t think that’s an overstatement!) writing content and running the site. It was my hard work that put me in that situation. That’s a great example! You weren’t actively looking for a book deal, but because you had invested so much into YAM, a publisher was interested and reached out. It can be crazy how some things come about, but like you said, hard work put you in such a position to take advantage of something like that. In my opinion, success is all about making the most of your own circumstances. Yes, some people may have had a different path to success. Sometimes this can even be perceived as “easier”. But even for those who have had a more fortunate life, it still takes hard work to make the best of their situation. Dismissing others’ success as just “luck” just perpetuates an external locus of control, making it difficult to make the changes necessary to better your own circumstances. That’s exactly what I was getting at, Stephen. Thanks for summing it up so well! THIS! I hate when people tell me I’m lucky that I could quit my job and work from home. I’m not. I just worked really hard to make it happen. Anyone can do it if they put the work in. Yep. When people say that to me I always make sure to tell them that it’s not as easy as they think, and I try to give them advice if it’s something they truly want to pursue. More often than not, they think it’s a pipe dream, which isn’t true! Hmm. I love asking people what proportion of success is due to luck and what to hard work and then hearing them explain their povs. I personally think luck is a huge factor in the greatest success stories I know, whether we’re talking $ or relationships.